The cell. 8. Meiosis. Atlas of plant and animal histology. The number of chromosomes is reduced by half during meiosis. 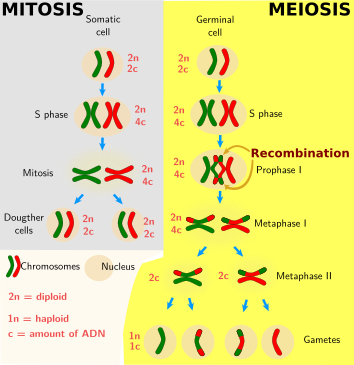 Chromosome recombination occurs during meiosis. Cells of pluricellular organisms can be classified in two broad groups: somatic and germinal cells. Somatic cells form nearly all the body and divide by mitosis giving two new somatic cells. Germinal cells, much less abundant, are found in gonads where they give more germinal cells by mitosis, or differentiate into haploid cells by meiosis. Gametogenesis is the process by which germinal cells divide by meiosis to give haploid cells and these haploid cells differentiate into gametes. Two things occur during gametogenesis: meiosis and cellular changes to get gametes. Association of father and mother chromosomes during fertilization, in the case of just two chromosome per progenitor. Before going further, let's see some concepts. Every cell contains two set of chromosomes, one coming from the mother and the other from the father. For example, if the cells of a species contain 4 chromosomes (in humans there are 46), the female provided two chromosomes (1m and 2m) and the male the other two (1p and 2p). 1m and 1p chromosomes have the same genes, i.e. the same protein, and they are located in the same order along the chromosome. However, these chromosomes do not show identical nucleotide sequences, although they express the same proteins, but there are little variations when comparing the nucelotide sequences. Genes located in the same position of the chromosome that code for the same RNA, although with slightly different sequences, are known as alleles. So, 1p and 1m chromosomes have alleles, two per gen, one coming from the male and the other from the female. 1p and 1m chromosomes are known as homologous. The same happens to 2m and 2p chromosomes. In this species, there are two couples of homologous chromosomes, whereas in humans there are 23 pairs of homologous chromosomes. After meiosis, there is just one chromosome of each pair of homologous chromosomes per gamete. Thus, in this species, every gamete contains two chromosomes (1m-2p, or 1p-2m), whereas in human gametes there are 23 chromosomes. Meiosis reduces the number of chromosomes by half, and there is always one chromosome of every pair of homologous chromosomes. Germinal and somatic cells, which have the two members of each pair of chromosomes, are known as diploid, whereas gametes, having only one member of every pair, are known as haploid. Meiosis is a cellular process that reduces by half the number of chromosomes. Every gamete keeps one chromosome of every pair of homologous chromosomes that were present in the germinal cell. Thus, during sexual reproduction, the fusion of two gametes (fertilization) from two individuals,a male and a female, gives a new cell known as zygote with the normal number of pairs of homologous chromosomes, i.e. it is a diploid cell that will give a diploid animal by proliferation and cell differentiation. Do not confuse meiosis and mitosis During mitosis, the DNA is duplicated and then divided between the two daughter cells, so that the two new cells have the same information as the progenitor cell. During meiosis, although the DNA is also duplicated, germinal cell divides twice (meiosis I and meiosis II) giving four haploid cells. In males, these four cells become spermatozoa and in females one of these cells develops into the oocyte. Somatic and germinal cells undergo mitosis. However, only germinal cells go through meiosis, a division process that gives haploid cells. Meiosis is not just a reduction by half of the number of chromosomes. During meiosis, there is also a molecular mechanism known as recombination. In somatic and germinal cells, the genetic information coming from the male and female are in separated chromosomes. Both, male and female provide one chromosome to every pair of homologous chromosomes. During recombination, there are interchange of segments between homologous chromosomes. It means that some genes that were in the chromosome provided by the female are now in the chromosome provided by the male, and the other way around. In this way, there are chromosomes with combination of genes that did not exist previously. After fertilization, these chromosomes with genes from both progenitors may influence the development of the new organism, which may provide advantages for survival. Mitosis and meiosis. Genetic variability in the offspring is consequence of recombination during the meiotic prophase, plus the distinct combination of male and female chromosomes in gametes. n: number of chromosomes provided by every progenitor, c: quantity of DNA, every progenitor provides 1c. Meiosis is similar in both male and female germinal cells giving spermatozoa and oocytes, respectively. Chromosome recombination and reduction of the number of chromosomes happen in all the species with sexual reproduction. However, big differences are observed between spermatogenesis (male gamete differentiation) and oogenesis (female gamete differentiation). Gametogenesis is also quite different between species. These differences give clues about how fertilization and posterior embryonic development of a particular species are going to be. 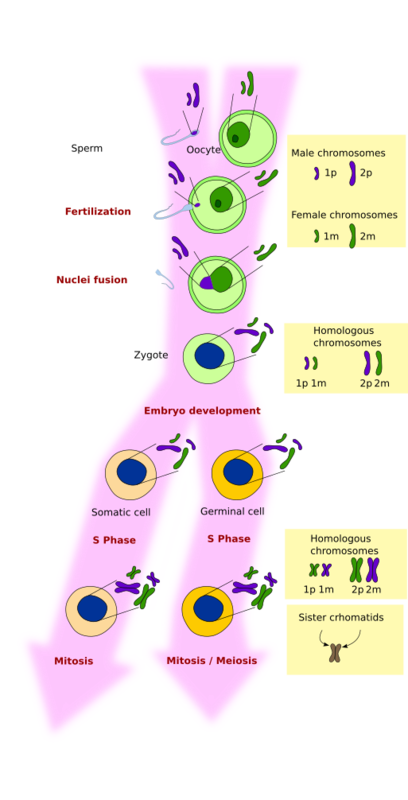 Meiosis has several phases in both males and females of all the species with sexual reproduction. Briefly, duplication of DNA during S phase, meiotic prophase (leptotene, zygotene, pachitene, diplotene, diakinesis), meiosis I (first division: metaphase I, anaphase I, interphase without S phase), meiosis II (second division: prophase II, metaphase II, anaphase II). Chromosome recombination takes place during prophase I, and reduction of the number of chromosomes during divisions: meiosis I and II.